Ah, summer. The season of easy, breezy style. Where dirty hair is acceptable and bright colors are not only celebrated but expected. It seems that summer outfits look best when they are thrown together in 5 minutes or less. It's all about effortless style and comfort. Throw on your most trusted basics, then grab a funky accessory and a bright purse and you'll be turning heads without even trying. 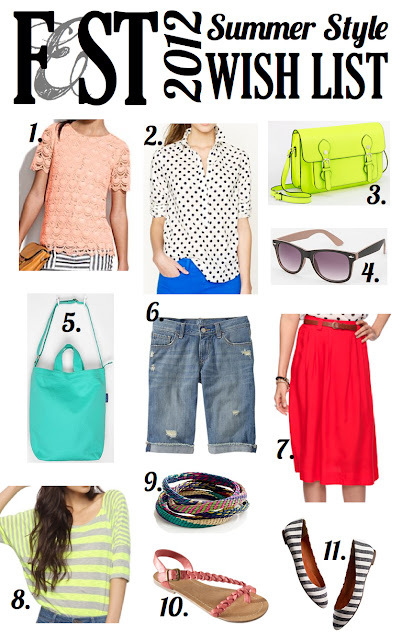 To see my 2012 Spring Style Wish List, click here. PS.. If you go to the front page of bloggers.com today, you might see a familiar face. i would like everything on that list please!! Bright colours on tan skin = best combo ever. Great collection! I just love numbers 8 and 10. I always loved yellow and gray stripes, for some reason they just look great. Love the J Crew polka dot blouse! The list looks great! I, too, coveted the Steve Madden bag but when I went to buy it at Nordstrom, they told me that they had to send all of them back because they were defective! :( but lucky for me, I found a look alike by Melie Bianco that is just as cute! look it up! I like number 8!! Thanks for stopping by my blog and leaving your nice comment! Hope to see you around again soon! I saw you post of FB--cute blog! Denim shorts are my fav for summer! scored those braid sandals for 12 dollars at target :) in love.